Recent release “Home to Mars” from Page Publishing author George Perreault is a splendid work of fiction that dives into the heart of extraterrestrial and human interactions and how this relationship shaped the course of history. George Perreault, a retired coast guard and software engineer, as well as a loving family man who is active in the church, teaching religious education, has completed his new book “Home to Mars”: a fascinating creation about the well-hidden lives of the interstellar folk from Mars, their struggles in dealing with humanity, and their steadfast hope for a return to their mother planet. 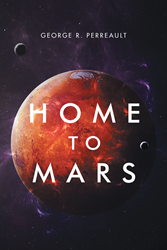 Readers who wish to experience this absorbing work can purchase “Home to Mars” at bookstores everywhere, or online at the Apple iTunes store, Amazon, Google Play, Kobo, or Barnes and Noble.